Winter Solstice, which occurs next Wednesday, marks the longest night and the promise of lengthening days thereafter. But as we Piedmonters know, even though days may begin to lengthen, the sun’s power is weak this time of year. Winter cold usually settles in for a few months right about now. I brighten the gloom of winter in my home by bringing bits of the outdoors indoors. A flower-bud-laden branch of the pink flowering apricot that I wrote about last entry sits in a small vase by my sink. Soon the warmer air of the house will coax the flowers into opening and sharing their fragrance. That, for me, was strictly a bonus — a consequence of the absurdly mild weather my area has been experiencing. Just in case the cold has imminent plans for me, I decided to follow my usual early winter survival protocol by bringing indoors some greenery from my yard. Exhibit A: the tray of greens in the above photo. 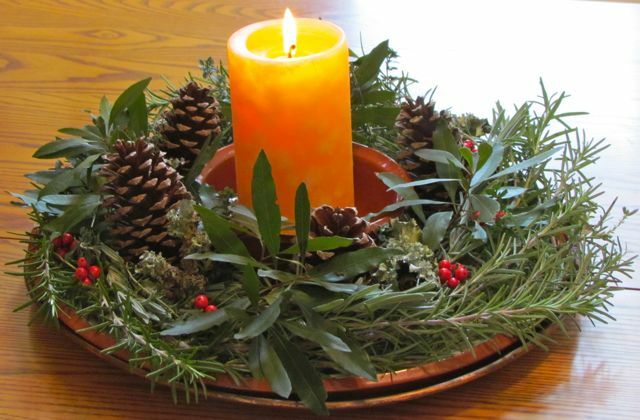 Plant materials include freshly cut branches of rosemary, lavender, wax myrtle, and small springs of lemon thyme. Nestled among the greens are pine cones, berries from my deciduous hollies, and pieces of lichen tossed to the ground by the winds. As the arrangement dries, the resins in the rosemary, lavender, thyme, and wax myrtle will perfume that part of my home. 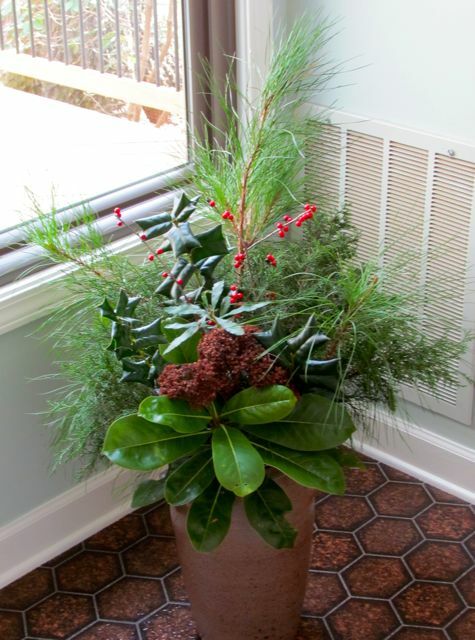 This arrangement includes a few loblolly pine branches, some red cedar, a small branch from my Southern Magnolia, a bit of wax myrtle, and some holly branches from an evergreen variety developed by the JC Raulston Arboretum. Accents are provided by branches from my deciduous hollies, and the dried flowers are from a Sedum ‘Autumn Joy’ that thrives in a flowerbed in my vegetable garden. The extra-rich soil in that area ensures that this Sedum’s flower heads are quite large; they dry naturally on the stems without any help from me. The resins from the pines and cedars should ensure that visitors will be greeted by scents many of us associate with this season. I made sure that the cedar branches I cut were adorned by their waxy blue cones that resemble berries. I’ve found that such branches are usually extra fragrant. After my arrangements were in place, I decided to search the Internet for clues about when winter cold might actually visit my area. So far, we’ve only managed two chilly days in a row before early autumn mild temperatures returned. The news was not encouraging for cold weather-loving Piedmonters. All the weather sites I visited agreed that winter will be cold and snowy in the Pacific Northwest and the Central US, especially Chicago. And the Northeast will get occasional blasts. However, the southeastern US seems likely to see a relatively mild winter. For Piedmont gardeners, this is a mixed blessing. We can continue to move plants and add new ones as long as the ground doesn’t freeze. But that also means that winter weeds will flourish enthusiastically. So will the bugs. To kill the mosquitoes still buzzing in my yard, I need a prolonged stretch of time with rock-solid frozen ground at night and days that never get warmer than 45 degrees Fahrenheit, preferably colder. If that doesn’t happen, all the bugs — and diseases — that make Piedmont gardening challenging will be present in abundance next spring. Of course, long-range weather forecasts are not known for their precision. Here’s hoping the cold lingers long enough to help our gardens, but not so long that it hinders our spring plans. This entry was posted on December 15, 2011, 5:28 pm and is filed under piedmont gardening. You can follow any responses to this entry through RSS 2.0. You can leave a response, or trackback from your own site.